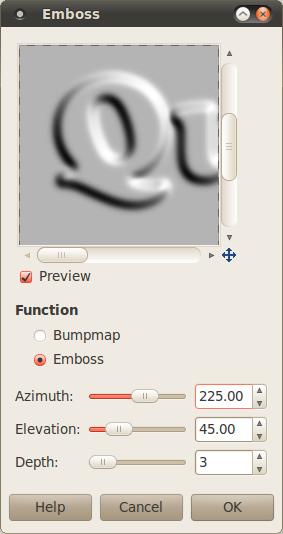 The original tutorial was found at http://www.state-of-entropy.com/ under PSP 5, and can easily be adapted to GIMP with minimal differences. Open any size drawing, with a white background. Use any font you wish, but rounded fonts work best. My drawing is 640 x 480, using Cooper Black font @ 150px centered on the drawing. Save a Path from Text, after centering the font in its permanent location. Right click the text layer and choose "Layer to Image Size". 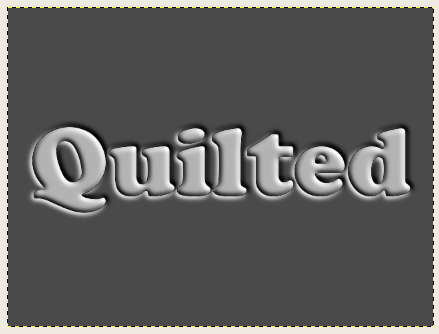 Merge the text layer down onto the white background layer. Duplicate the resulting layer. You should now have two black text on white background layers. Select/highlight the bottom-most layer and run a Gaussian blur of (12 px). Select/highlight the top-most layer and change the layer mode to Difference. 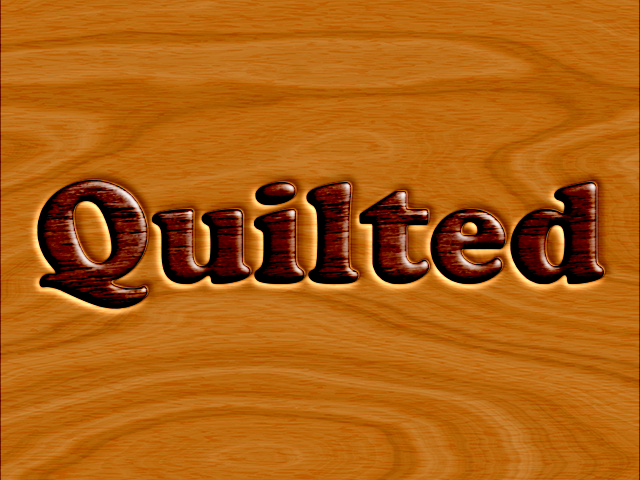 TIP: Also check out Overlay and Soft light modes for making pretty awesome 3D text. The edges are still a little jagged and can be easily fixed by running Gaussian blur of 3px on the top-most layer. Add pattern layers or color layers (do not fill selections with color or patterns on the original layer) and choose Hard Light or Grain Merge for your layer mode. Feel free to experiment with the different modes to see their results. Using the text path, I inverted the selection for the background, then created a second pattern layer for the text with the path selection not inverted, using Burn as the layer mode. I am pretty new to all of this and what I do know was just by muddling my way though it and using YouTube. I get the idea of it, but I have no idea how to or if I am "using the text path" to get the background colors in. Could you please explain this a little more for the Gimp challenged? 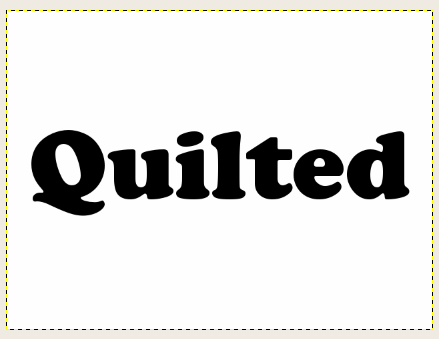 You're using the text path, using the word Quilted in the image above as an example, and converting it to a selection, invert it on one layer and fill it with whatever you wish (patterns, images, etc). Change the layer mode to blend (I recommended hard light or grain merge). Just don't fill the original layer. For the word itself, invert the inverted text path so that the selection is just for the word (like quilted, above) and on a new layer, fill it with a pattern, image, etc. Make sure to change the layer mode to blend, as well. Thank you for your reply, but in all honesty... I have no idea what your talking about. I have never used the text path option before, so I really am having a hard time following what you are saying. When you use text, you can convert it to a path (path from text button). Once you convert your text to a path, you can re-use it for selections. The selections allow me to fill different patterns. I'll make a short YouTube in the next few days, showing this. Well, its been over a year now. Did you complete the tutorial? Verbose Description - Step 4: Add new transparent layer. Set layer mode to 'Grain merge'. Ensure the new layer is highlighted and selected (move the new layer to the top). 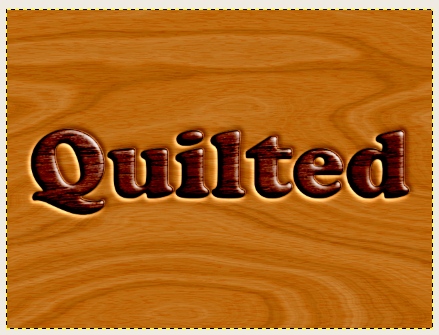 Assuming 'Path to text' was clicked in step one, select menu item 'Select'->'From Path' (This should select the text 'Quilt'). Using bucket fill, select 'Pattern Fill' (Bucket Fill Mode should be 'Normal'). 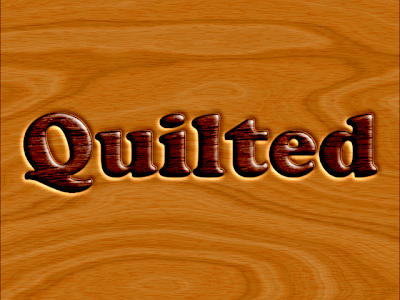 Select one of the wood grains, and fill the text 'Quilt'. Now, select the menu item 'Select'->'Invert' so the background is selected. Using the bucket fill, select a different wood grain and fill the background. You guys really need to provide some sort of ID, even if vague, or add your nick in the comments. I did not make the video tutorial, thank you for reminding me. Some people need to see, others need lots of details, it's all good... I'll try and get something together tomorrow (Saturday). Trying to find a decent Windows screencaster to do this tutorial as a video. Not having much luck.